Luce's last post got me thinking about some ridiculous food item's I've seen around the internet. While I re-scour this series of tubes they call the webaverse I thought I'd share one of my favorites: the bacon-cheese pizza burger! I knew you would love that. I wanted to sneak it in there. 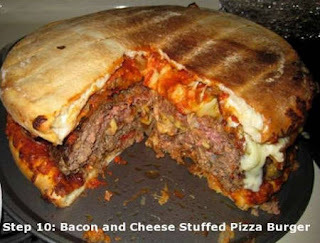 Also this burger pizza picture makes me gag to the maxxx.